As my own view of Starbucks (NASDAQ:SBUX) has wavered, Starbucks stock has moved decisively from its June low of under $50 per share toward its 2018 high of $62. The company recently announced a $5 billion buyback of stock after activist Bill Ackman began nibbling on shares, along with plans for a reorganization and lay-offs at its Seattle headquarters that could boost profit. As a result, analysts are getting bullish. There is also hope that the situation with China could settle down, and that would provide the biggest boost of all. Starbucks is committed to China in a way we haven’t seen any U.S. company commit to it in decades — and if you’re buying Starbucks stock for the long term, you’re betting it’s right. While most fast food chains are moving toward a franchise model, Starbucks continues to own its stores. This means it takes operating risks, but also that it takes all the profit when those stores do well. In China, Starbucks is opening a new store every 15 hours, with plans to have 5,000 there in 2021, about half as many as it has in the U.S. Under Belinda Wong, formerly with McDonald’s (NYSE:MCD), the company is even more innovative there than it is here, relying on a mobile app for 60% of its sales, in partnership with Alibaba Group Holding (NASDAQ:BABA) and Tencent (OTCMKTS:TCEHY), the fastest-growing retailers in the country. The agreement with Alibaba is dubbed “new retail” and integrates the company into Alibaba’s Ele.Me delivery services, Alipay payment system and (perhaps, most importantly) Hema supermarkets, which are opening “Starbucks Delivery Kitchens” that could help it expand in food, where it’s weak. The company fully committed to China last year by selling out of Taiwan and buying out its mainland partners, a $1.3 billion transaction. If any U.S. company is going to make a Chinese national its CEO, my guess is it will be Wong at Starbucks. Meanwhile, Starbucks is making smaller moves in the U.S. aimed at boosting the top line, tightening operations and keeping employees in a tight labor market. Its latest effort to put food in stores that are the size of a small apartment is sous vide, packaging eggs in airtight containers that cook in hot water. It’s a mini-omelette that can be delivered in just 1-2 minutes. Starbucks is planning layoffs, closing stores more aggressively and has hired a new finance officer from Hyatt to tighten operations. At the same time it is offering employees access to day care, through Care.Com, which goes alongside its existing perk of free online tuition. I have been of two minds about Starbucks stock. I owned it for a time, but sold out and, most recently, suggested investors ditch it. On the other hand, I suggested buying it as recently as May and, if you followed my advice, you just broke even. My current view is everything depends on China, which means a lot depends on U.S. policy toward China — and the views of Chinese toward Americans. China promises enormous growth, but if Chinese people are told to hate us, Starbucks could quickly find itself replaced by a made-in-China clone, possibly run by one of its Chinese partners. With a price-to-earnings ratio under 19, and solid management that’s paying down its as fast as it can, I want to believe in Belinda Wong. But until the trade war clouds part, I can’t make myself pull the trigger on that. Dana Blankenhorn is a financial and technology journalist. He is the author of a new mystery thriller, The Reluctant Detective Finds Her Family, available now at the Amazon Kindle store. Write him at [email protected] or follow him on Twitter at @danablankenhorn. As of this writing he owned shares in BABA. 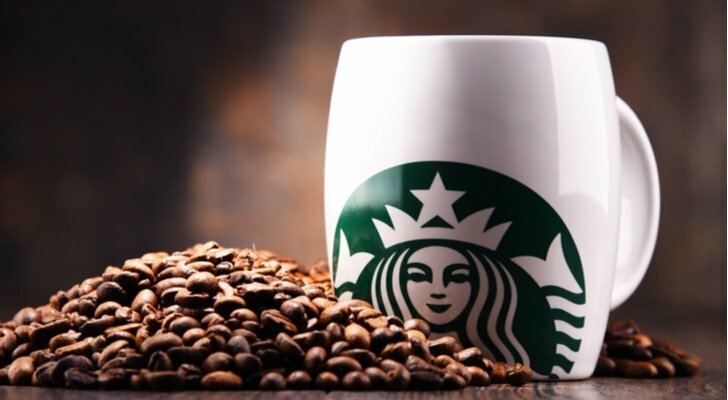 Article printed from InvestorPlace Media, https://investorplace.com/2018/10/whats-behind-starbucks-stock-breakout-sbux-behind-the-break-out/.